Thibodaux is a bustling town comprised mostly of farmers, trappers, fishermen, petrochemical workers and college professors. Its roots are squarely Cajun. Rice and sugarcane are agriculture mainstays, and because this is Louisiana, sooner or later someone had to have the idea of distilling those crops. Donner-Peltier Distilling in Thibodaux is newly built, licensed, running and well on its way to creating premium brands of vodka and rum. 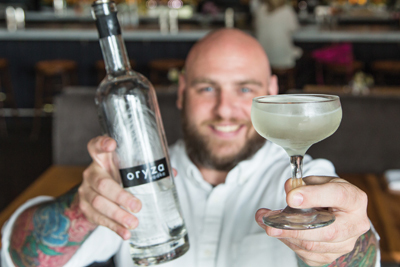 Their top-level vodka is Oryza, distilled 17 times from a genus of rice by the same name. About an hour away, there’s the Faubourg Sainte Marie in New Orleans, also known as The American Sector, or simply the Central Business District. It is where tall buildings for commerce and wide thoroughfares for traffic converge. Ste. Marie Brasserie is a fine-dining, fine-drinking establishment on Poydras Street. It was named one of the Best New Restaurants of 2011 by this magazine. Add all ingredients together into a rocks glass. Stir 40 to 60 times with fresh ice. Strain into a martini glass and finish with two drops of Ilegal Mezcal. As created by Murf Reeves, managing partner at Ste. Marie Brasserie, 930 Poydras St.